EXEDY is stamped on the Clutch Cover and Clutch Disc for proof of authenticity. 2000 - 2003 Honda S2000 (2.0L 4cyl, F20C1). 2004 - 2009 Honda S2000 (2.2L 4cyl, F22C1). 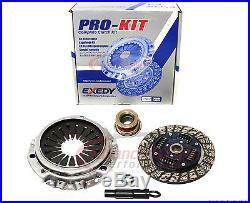 EXEDY OEM Replacement Clutch Kit. Spline Teeth / Major Diameter. This is a brand new genuine EXEDY OEM Clutch Kit. This clutch kit contains the main essentials to do your clutch replacement and is perfect for any stock motor or slightly modified car. EXEDY Corporation of Japan(DAIKIN) is one of the biggest independent OEM suppliers in the world. They supply all of the major Japanese vehicle manufactures and some U. S brands like GM and Ford. Unlike their competitors, their clutches have not been rebuilt OE, or modified stock clutches. All EXEDY OEM and Racing/Performance clutches undergo proper engineering, design and built from the ground up as race clutches, in the shadow of the OEM products. EXEDYs product's are patented worldwide and developed in house using magnificent design, inspection and testing equipment. Before any design goes into production it goes through numerous tests that roll play severe driving conditions, which ensure perfect performance in your vehicle all the time. Please keep in mind that no part will leave the EXEDY factory without an advanced robotic and visual inspection, which guarantees quality you can always stand behind. EXEDY clutches are built to give you the best driving experience. Our genuine EXEDY clutch kit includes. Exedy Clutch Disc (213mm, 24 spline). We not only value our customers but we also value their needs and demand for a quality car part. We have come to accomplish three goals. The first goal is to provide car enthusiast with an important car part that will not break and will perform fantastic when using on and off the Track/Street. Our Second goal was to provide car enthusiast with a critical car component at high quality and at an AFFORDABLE price. Most importantly, We believe that every car enthusiast should be able to experience some performance level in their car application at the right, affordable price. Quality and Affordability are our Key factors and beliefs within our company. Must be in original packaging and brand new. Items that have been used, installed, damaged, or altered are non-returnable. Any damaged merchandise received must file a claim with the carrier and not with GRIP Clutch. All PUCK CLUTCH DISC(S) need at least 500 miles for break-in. All KEVLAR DISC(S) need at least 1000 miles for break-in. All FULL FACE ORGANIC DISC(S) need at least 200 miles for break-in. The item "EXEDY CLUTCH PRO-KIT 2000-2009 HONDA S2000 2.0L F20C 2.2L F22C fits all model" is in sale since Tuesday, January 06, 2015. This item is in the category "eBay Motors\Parts & Accessories\Car & Truck Parts\Transmission & Drivetrain\Clutches & Parts". The seller is "advancedclutchsolution" and is located in Montebello, California. This item can be shipped worldwide.